What vintage motorcycle hails from Germany, started production in the 1920s, has a flat twin air-cooled motor, is found primarily in black, and has shaft drive? Did you just say BMW? Correct, but there is another. Zundapp. The company began in 1917 as a manufacturer of artillery fuses ( a rare departure from the more common bicycle roots). It was taken over in 1919 by Fritz Neumeyer and moved into motorcycle production in 1921, just a few years before BMW. The first product was a 211 cc two stroke machine with a British motor, but it proved popular and over 1000 units were made in the first year. It became known as the Volksmotorrader, or "everyman's motorcycle". This was many years before the Volkswagen ! At it's peak in the late 1920s, Zundapp was producing about 4200 machine per month ! The depression hit Zundapp hard, but in 1934 it introduced another small two stroke called the Derby. This machine was also very popular, and the factory struggled to keep up with sales. WWII turned Zundapp into a military supplier just like everyone else, and civilian motorcycle production did not resume until 1947. The KS601 597cc opposed twin was the fastest German street bike of the time reaching 88mph. The factory moved to Munich in 1950, and small two strokes were again the focus with the company achieving some sporting success in the mid 1950s. These small machines along with scooters, allowed Zundapp to survive better than most into the 1960s. Chief among the sales successes was probably the wildly popular Bella scooter. 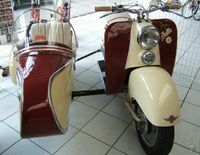 Scooters, mopeds, and small motorcycles continued to sustain Zundapp well into the seventies, and sales were healthy. They even won the world motocross championship in the 125cc class in 1973 and 1974, and the ISDT trophy in 1975 and 1976. This contributed to sales of 110,000 units in 1977. However, in the late seventies, financial problems and a rather rapid decline set in. Larger displacements, modernization, and the decline in two strokes all contributed. The firm went bankrupt in 1984.